As the basic model of the snom business telephone family, the snom 300 covers the most important requirements of VoIP telephony and additionally offers numerous functions that are indispensable in the business world. For effective everyday work, the snom 300 provides all relevant office functions such as choice of trunk line, status display, group lines, the engaged option or picking up calls. When it comes to user friendliness, the snom 300 sets new standards: A two-line graphical LCD display enables the display of call information, and the menu-driven user interface provides the simplest of feature management. Via the navigation key, the user is guided intuitively through the telephone menu. 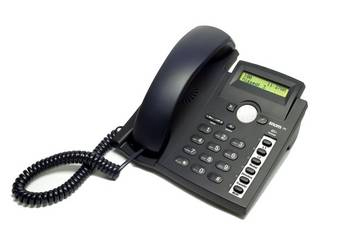 More complex telephone functions, call details and configuration possibilities are accessible via the browser over the connected PC. Six free user or administrator-configurable (or carrier-preconfigurable) function keys can be easily allocated to security-related menu functions, or assigned to multiple lines. The snom 300 is designed for different environments: for small offices, call centers, lobbies, recreation rooms, or in the home. It fits into its environment without any troubles. Through numerous telephone functions, the demands of everyday office communication can be easily managed. The snom 300 has a headset connection and can be used as a freestanding or wall-mounted model. All characteristics listed can, due to the constant development of our products, be changed without special notice. Depending on local specifications or market demands it may be the case that products are only available with deviating features or settings. Deviations from the illustrations, including the color, are possible.